For centuries, comets have inspired awe and wonder. Many ancient civilisations saw them as portents of death and disaster, omens of great social and political upheavals. 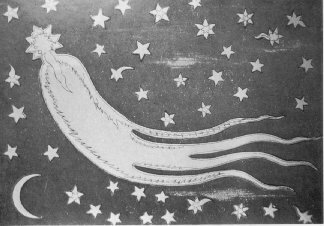 Shrouded in thin, luminous veils with tails streaming behind them, these 'long-haired stars' were given the name 'comets' by the ancient Greeks (the Greek word kome meant 'hair'). Until Giotto, no one knew what a comet nucleus was really like. The problem was that it is impossible to see a comet nucleus from the Earth. As soon as a comet nucleus moves close enough to us for detailed observation, it is obscured from view by a shroud of gas and dust. The most popular theory about the nature of comets was put forward by American astronomer Fred Whipple, often known as the "grandfather" of modern cometary science. Whipple believed they were like dirty snowballs - large chunks of water ice and dust mixed with ammonia, methane and carbon dioxide. As the snowball approached the Sun, its outer ices began to vapourise, releasing large amounts of dust and gas which formed the characteristic tails. Today, largely thanks to data from Giotto and the Russian Vega spacecraft, we now know that Whipple's model was fairly accurate. A comet nucleus resembles a fluffy snowball (usually only a few kilometres across) coated with a crust of black material and spouting jets of vapourised ice. Despite these advances, scientists want to learn more about these occasional visitors to the inner Solar System. Further studies are important for a number of reasons. Comets probably acted as building blocks for the planets. They are thought to have formed about 5 billion years ago from the vast, rotating cloud of material which surrounded the young Sun. In those violent times, many comets crashed into the young planets. Craters caused by ancient comet and asteroid impacts can still be seen on the surfaces of the Moon, Mercury and many planetary satellites. Comets may also have provided some of the water which now forms Earth's oceans, and may even have delivered the complex organic chemicals which led to the first primitive life forms. At the time of the Giotto mission, approximately 1 000 comets were known out of the many millions thought to exist. Studies of comet orbits suggest that most of them reside in two zones on the frigid edge of the Solar System where the temperature is so low that they can hold onto their ices. The Edgeworth-Kuiper Belt lies just beyond the orbit of Neptune, 30 to 100 times Earth's distance from the Sun. Pluto seems to be its largest member. Since 1992, dozens of objects, each several hundred kilometres across, have been found in this region. The Oort Cloud is thought to occur much further out - 10 000 to 100 000 times Earth's distance from the Sun. This huge spherical region may contain billions of cometary objects. Very occasionally, these ice worlds are dislodged by collisions or gravitational tugs from a giant planet or passing star. They may be sent inwards, towards the Sun. As they get warmer, their ices change to gas. The tiny nucleus becomes surrounded by a coma of gas and dust, while enormous tails stream away from the Sun, extending millions of kilometres into space. Yet these tails are extremely thin and insubstantial. In 1910 the Earth passed through the tails of Halley's Comet with no effects whatsoever. Many comets (e.g. Hale-Bopp which lit up the skies in 1998) arrive without warning from the depths of the Solar System, sweep around the Sun, then disappear once more, never to be seen again for thousands of years. However, their paths may be altered by the gravitational pull of the Sun or giant planets, especially Jupiter, if the comets pass too close to them. As a result, comets may become trapped in the inner Solar System or even collide with the Sun and planets (e.g. 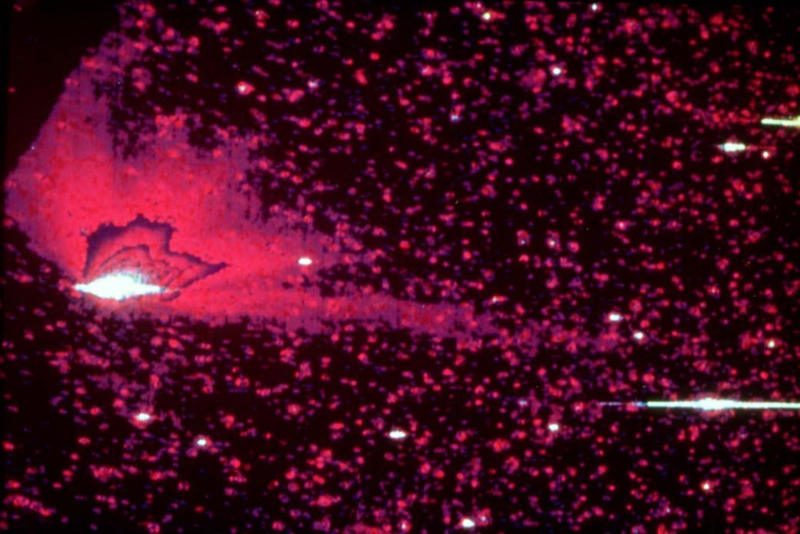 when Comet Shoemaker-Levy 9 broke into pieces before crashing into Jupiter in 1994). Occasionally, comets may crash into the Earth. One of the most recent examples took place over the Tunguska region of Siberia on 30 June 1908 when a comet or asteroid exploded in mid-air, flattening trees for hundreds of kilometres in all directions. If a similar event took place over London, the entire city would be flattened. Comets Halley and Grigg-Skjellerup were ideal targets for space missions because they are both classified as periodic comets. Their orbits are well known and astronomers can plan to visit them years in advance since they return to the vicinity of the Sun over quite short periods of time.